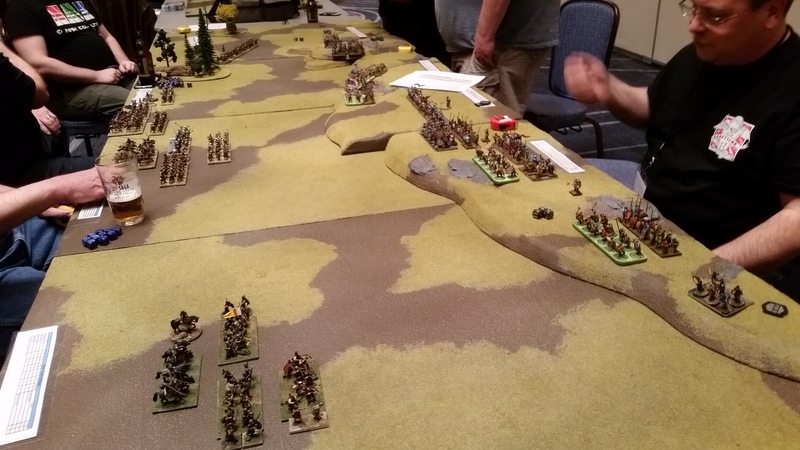 My third and final Adepticon battle of 2016. 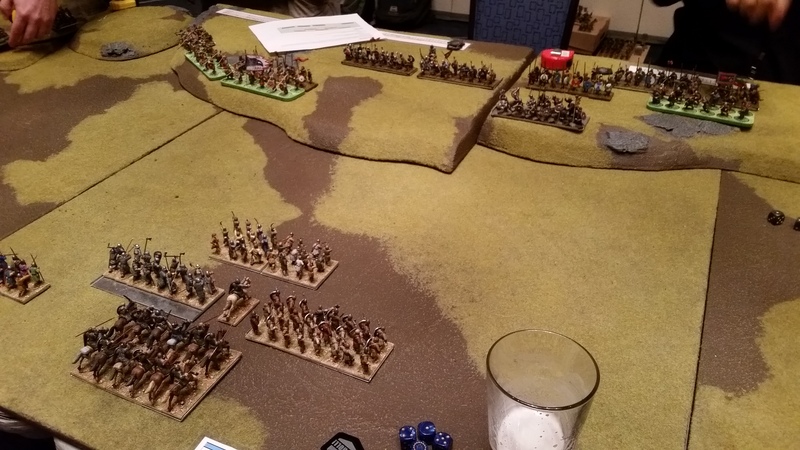 The Battle of Hastings was fought in the Saga Hall on Saturday night with copious amounts of wine, women and song (or at least beer and pizza). Nine players joined the battle with 5 playing the role of Harold and his troops and 4 fighting as William and his Normans. The challenge with Hastings is that the Saxons have zero mobility and a strong defensive position, while the Normans have plenty of fast knights as well as a strong rank of bows/crossbows. Given that combination, motivation needs to be provided for the Saxons to do more than sit there and take on arrows the whole game. The motivation took the form of an objective marker place behind the Norman left flank. The second element is the historical death of Harold and his brothers. This was solved by giving three of the commanders 5 attacks, with the rule that any wound taken would count as a kill. As luck would have it, the game played out nicely with the Saxons coming off the hill to engage the Britions and capture the objective. The lure of 5 additional dice proved too much and successfully lead to the glorious deaths of Harold and his brothers. With the death of its leaders, the Saxon line was broken and victory was declared for the Normans.